Having recently completed a stunning refurbishment, our stylish and spacious country house in South Lanarkshire is the perfect place to host your perfect day. 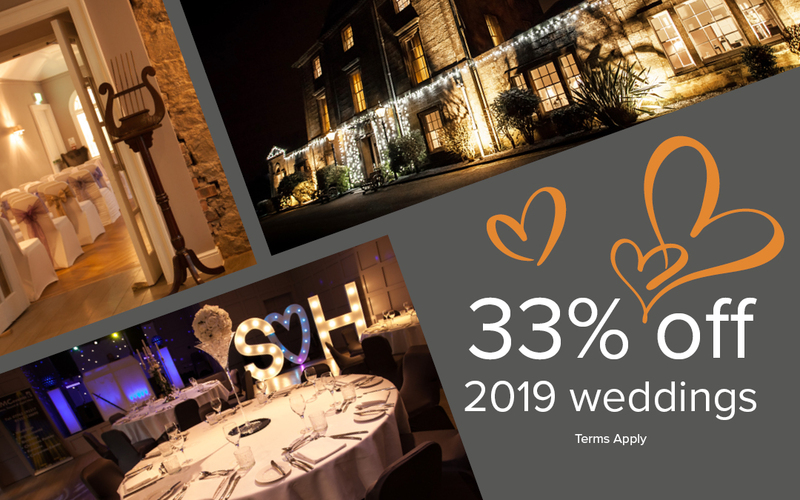 Book a midweek date and take advantage of our 33% off wedding promotion, exclusively for 2019. Whether you have a clear vision for your wedding, or just need help in deciding what to do, our experienced team will make sure every detail of your big day is clearly planned out. With a photo perfect exterior, we offer a selection of menus and can tailor special requests, ensuring that your planning is care-free. 33% discount applies to weddings taking place Sunday-Thursday. Offer applies to new bookings only and excludes bank holidays and the festive period. Offer is subject to availability. Minimum numbers may apply. £55 per person wedding package applies to 2019 only. Why not come along to our next wedding open day and find out all about our venue. See our suites set up for a wedding and have a chat with our team.